Make a sound investment today – give your child your time! Create quality time to spend with your children before they grow up and don’t have any time for you! Caught up with our own busy careers, we often tend to postpone family time and sometimes see our kids’ activities as unimportant in the face of several more pressing tasks. Our children are very forgiving and won’t really grudge it if we miss an annual day at school or a pantomime they are participating in. But soon, sooner than you can even imagine, they would have grown up and flown away into the big world – to build their own careers and raise their families. You may have all the time in the world for them then but they will have none to offer you! On my evening walks, I often see a father-son duo that we know of. They don’t know us. But we know of them and their family. The son is a strapping teenager. Tall and handsome. Must be close to 18 or 19. He can’t see though. And he is autistic (we know of his condition through a common family friend). Most evenings, the father will bring him along on a motorbike. The neighborhood we walk in does not have any traffic to speak of. So, the father will ride the motorbike a few times through it. The boy will be delirious with delight as the breeze pampers his face. He will raise his hands and at times yell in glee. After a few rounds on the motorbike, the father-son duo will walk through the neighborhood. The father will hold his son’s hand and tell him all that’s going on around them. The boy will ask several questions and seek graphic details__which, given his autism, I find, very remarkable. The father will patiently answer his son and provide each detail that he seeks. I find their camaraderie inspiring. In fact, it sometimes makes me feel guilty. In the years that my son was in his teens, I made little time for him. I rue the fact that I missed several of my kids’ special days in school because I was always having, as I vainly reasoned to myself, ‘more important and urgent things to do with the business’. So when my son went away to study in Chicago some years ago, I felt the void in our half-empty nest the most. I couldn’t reconcile to the reality that our child had flown away even when I had not been around much during his growing up years! I am glad though that one summer, when he was 17, we, just me and him, went on a vacation to Rajasthan. That will be a precious memory for me, forever, of spending quality time with him. Mercifully, we have a good friendship between us though. However, I made amends with my daughter. Apart from Life, and business, slowing down and offering me a lot of time to watch her do the things she loves doing, I also made it a point, with my wife, to be at each of our daughter’s special moments. Yesterday, for instance, we spent two beautiful hours watching her perform at an ‘Acapella’ concert with her very talented college band. I have realized that we don’t need a handicap or a natural process of growing up to remind us that there are far more important things to do in Life than build a career or a business. Nothing can compensate for the joy of witnessing your child express herself or himself. 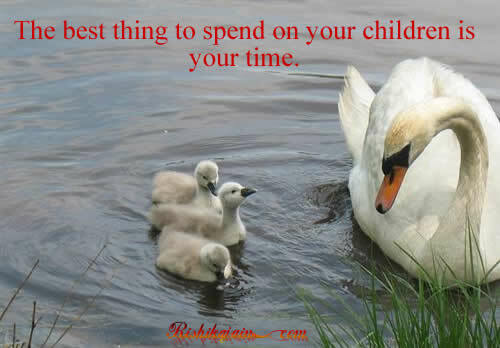 Making time for being with your children is perhaps the best investment decision you will ever make. And here’s a simple tip to create that time in your packed calendar – just allot all the time you spend worrying about the lack of a work-Life balance to your children! And voila! Not only will you feel enriched, your work-Life balance will be instantaneously restored too! Author AVIS ViswanathanPosted on July 7, 2013 March 14, 2016 Categories Acapella, Art of Living, Autism, Chicago, Children, http://schemas.google.com/blogger/2008/kind#post, Inner Peace, Intelligent Living, Investment, Motorbike, School, TimeLeave a comment on Make a sound investment today – give your child your time!